I had heard good things about Don't Breathe (directed and co-written by Fede Alvarez) and so I was excited to see it. I knew the general gist of the movie as a podcast I listen to had talked of it but for once previously at the cinema I hadn't seen a trailer for it. Set in Detroit and three amateur burglars; Rocky (Jane Levy), Alex (Dylan Minnette), and Money (Daniel Zovatto) have decided to rob the house of a war veteran (Stephen Lang) as they suspect he is keeping thousands of dollars there. Despite discovering that he is blind they go ahead with the break in. Things don't go according to plan though as they discover the blind man is very far from helpless and soon they must fight with their lives to escape his tomb of a house. My first thought was how the three 'heroes' we're going to be portrayed, robbing both a war veteran and a blind man is a pretty low thing to do. First we have Money who is the bad one of the trio, meanwhile Alex is the straight one who has a conscience, lastly is Rocky who is more in the middle but due to a scene involving her abusive family good motivation is provided. Once it was established the blind man is not as innocent as at first appears I was able to root for these people more. The three young actors all do a fine job, especially Levy who is both vulnerable, but also more importantly comes across as a human with sides to her personality. Lang is great as the antagonist coming across as a movie monster more than a human (and also having the film's stand out line), the make up effects on his eyes, and the way he stops and sniffs the air constantly made him seem like a beast. It was hard not to make comparisons between him and Stick (from Daredevil) both are of a similar age and have the same hair, that did take away some of the fear factor of this character for me. His dog was also impressive, at least in terms of looking intimidating and snarling. 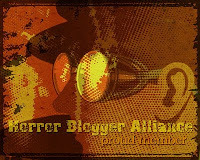 With just three good guys I wondered how the suspense could be sustained yet Don't Breathe does an admirable job of keeping my heart in my mouth in countless suspenseful scenes, usually involving the sighted trying their best to stand as still as statues while the war vet grunts and growls as he searches the room. There were maybe too many scenes of peril towards the end when a multitude of false endings kept me jumping, there must be a good fifteen minutes when I repeatedly thought the film was to end then something else crazy happens! 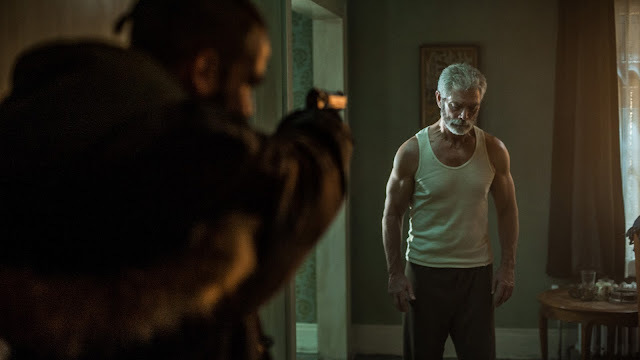 It's been a year for disability horrors, earlier on we had Hush about a deaf woman being hunted by a home invader, now Don't Breathe about home invaders being hunted by a blind man. What's next? My money is on a mute home invader...but I guess that's pretty much The Strangers anyway. While I really enjoyed the film I couldn't help but get deja vu with Wes Craven's The People Under the Stairs, especially a part that had the rabid dog hunting someone in the ventilation shaft. Meanwhile one scene was lifted straight out of the end of Halloween II. I love what the audio design was like for this, it seems incidental noises such as creaking floorboards and even people breathing was ratchet up to 11, details usually in the back ground are very apparent giving the viewer the blind mans sense of the world. Taking cues from the films title everytime a character loudly breathed in my mind I was screaming for them to be more quiet! Frequently the movie goes dead silent and there was one fantastic scene where the blind man hints his prey in a pitch black basement. Does lead to some plot holes such as why after plunging the house into darkness does the blind man (seemingly off camera at some point) turn all the lights back on? Also no idea why he has such a sophisticated alarm system linked up to the local police station when he obviously wants to be left alone in the world. 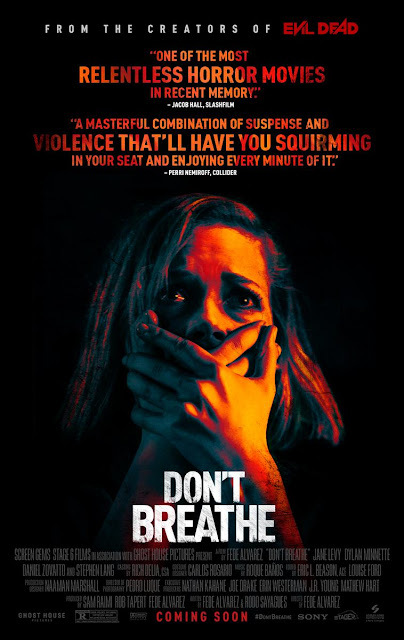 Despite a few too many similarities to other horror films I loved Don't Breathe, the way the audio is mixed, Lang's unsettling performance as the blind man, and the wonderful make up effects for the many injuries the cast get made this a memorable and well crafted piece.